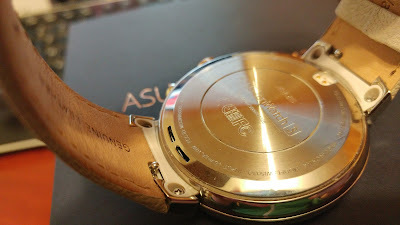 I love watches again. I went so long without one, and ever since putting on Android Wear just to be geeky I can't imagine not wearing them. Often I'll get some odd looks from others when I wear my watch. Some say 'oh cool', but they're usually geek enthusiasts like me. Others really look at it and say "that shouldn't belong, it looks out of place". Meaning it just looks like a piece of tech where a watch should be. And then there's the ZenWatch 3 by Asus. I got this the other day, and the only word I can come up with is CLASSY. And it really is. It looks amazing. 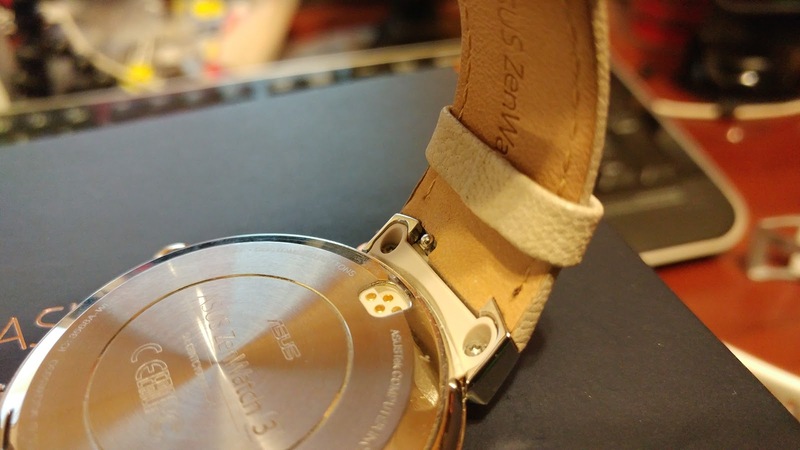 Stylish metal, leather band, buttons that make it look like it's a real real watch. At $350 it looks like it should be something more expensive. 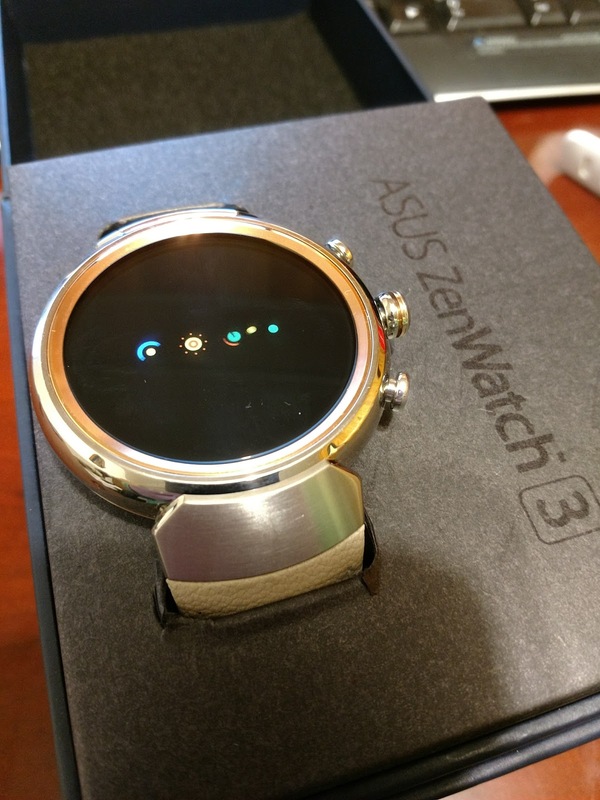 It was fun showing people who normally wouldn't think about a smartwatch, see this and go "oh, now that's something I would wear." So let's see how it lives up to real usage after I had it on my wrist for a week. 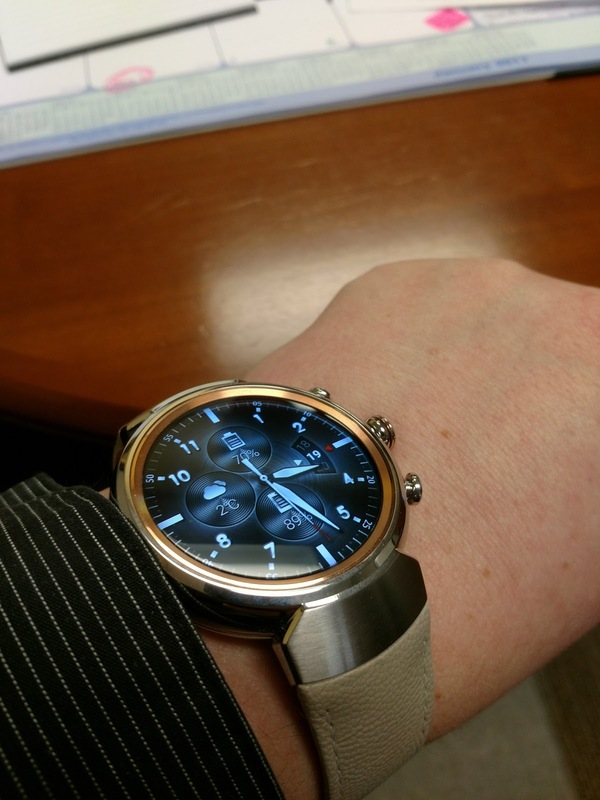 It is just slightly larger than my Moto 360 Sport with a better resolution and that makes it feel actually a lot bigger for real estate. Most of the other guts are the same. Slightly larger battery, but no heart rate monitor (that was a hard pill to swallow actually). But really no surprises from any other hardware wise. Except the speaker. That's new. 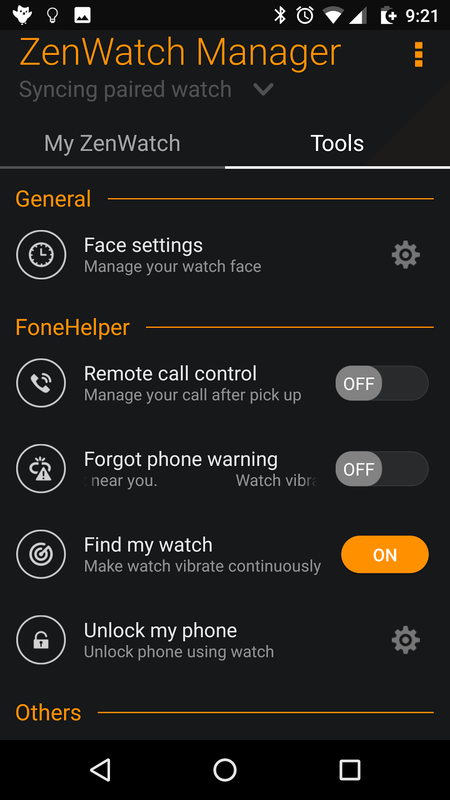 It was really cool to be able to set timers on the watch and have it beep, or have it play a tone when the phone rang. I'll admit, though, I didn't test it to see if it would hold a conversation. Mostly because I rarely use my phone 'as a phone', and another part because I don't think I'd ever use that feature if I did. 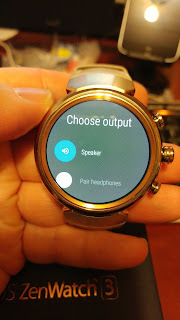 Playing my cached music on my watch over it's speaker was a nice treat. Can't say I had a real any real opportunity to say it was 'useful' versus just being 'novel'. 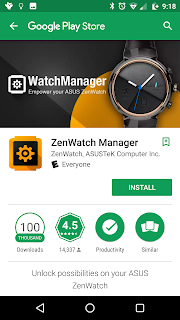 Now, turning it on, it's standard Android Wear (due to be upgraded to 2.0 when it is released) so nothing you wouldn't be familiar with, except that it has a couple Asus specific apps. First up is the Button Settings. So this phone has 3 buttons. 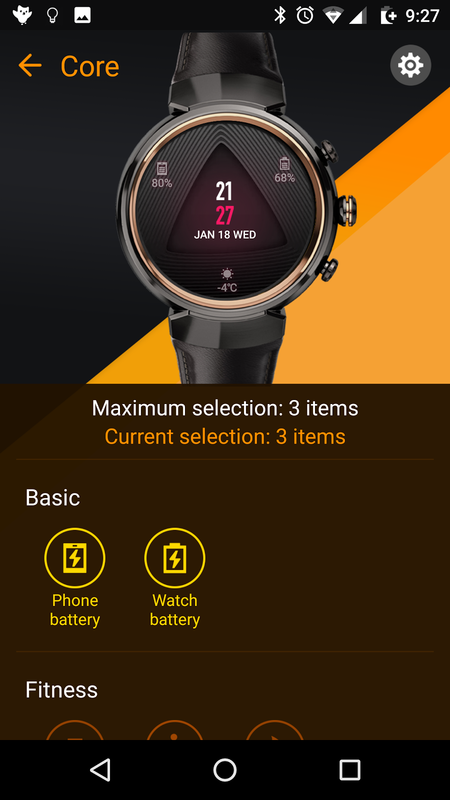 The middle acts like any other button on Android Wear: hit it once to bring it back to main screen, hold it to bring up apps. Personally, I never use it. It's way easier to slide to bring up the apps. But that's me. 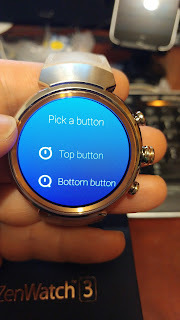 The other 2 can be customized with the button settings app. 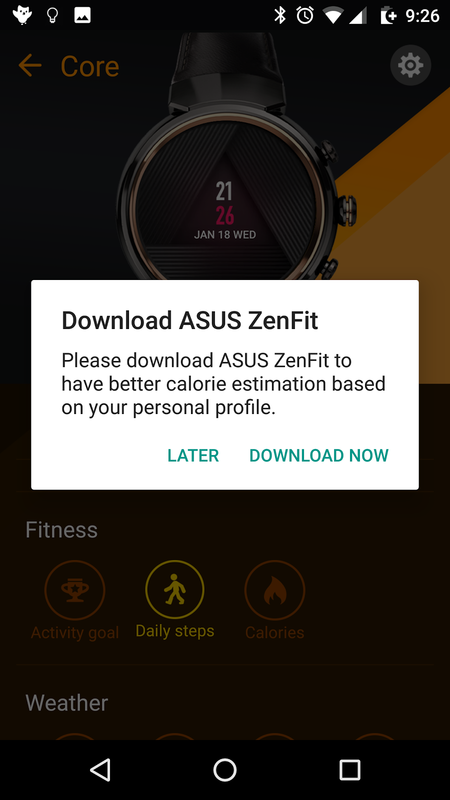 The top is defaultly set to loading up Asus Health, and the lower for jumping to "Ecomode"
Ecomode changes out some settings so your battery can last longer (when you go into it it's just turning off the sensor to know you've tilted it to turn the display on or wake from ambient display). Then there's the app you'll use on your phone. 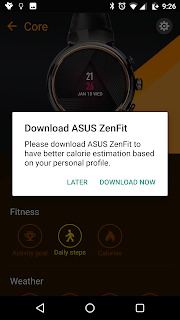 Sure, it can be pretty well all set up from Android Wear, but if you want to make the most out of the device, there's a special Asus Watch app. Here it has options to not only customize the wallpaper (which you could do in the Android Wear app) but goes further by letting you customize it. Also, there's a lot of very classy looking faces on the app. Customization options are, unfortunately, limited. Some of them only let you put up to 2 widgets, and at most 3. 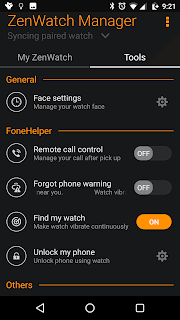 So if you want more options, there's plenty of other faces to install. I think these faces just really show off the class that is this watch. Outside of the apps and new features. 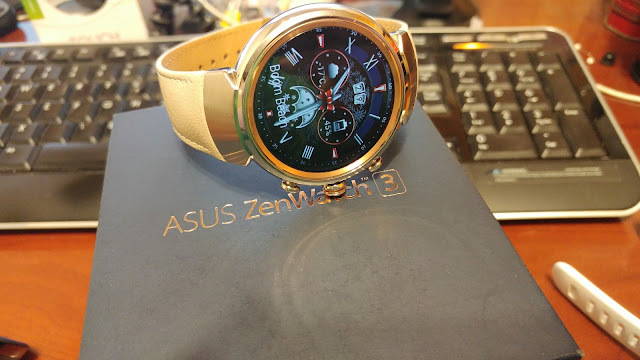 Well, I noticed it was a little laggier than my other watches. Which was disappointing. Especially, seeing as it had the newer Snapdragon just for Wear devices. Would anybody else be upset by it... probably wouldn't notice it. Just I sure did. Also, I found that although it's a slightly larger battery than my Sport, it didn't last as long. Taking it off charge about 7am and going about the day until about 11pm leaves me with about 20% or less. Depending on the day. I think that comes from the fact the ambient display is not really all that much different from the awake display, so it's drawing a bunch of power. I couldn't find a settings to disable that. That being said, the display is amazing. It really does look great. The better ppi on this display is really felt like it is a larger display and the colours are really good. Really giving off the 'classy style' of the device. 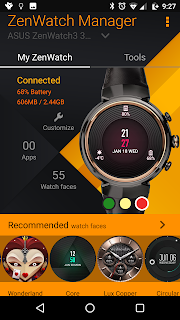 You don't want to show off this great looking watch and have a lower quality display. Couple that with the fact that you can customize not only the faces, but the bands as well it makes for a really ... I keep wanting to say 'classy' ... experience. 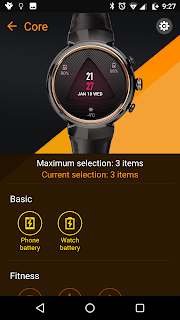 Make it fit your look, face and band (and choice of metal colours). I just wish it had the heart rate monitor.